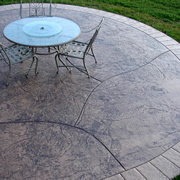 Stamped concrete can be exotic, over-the-top, intricate, and extremely eye-catching. You might think to do all that it also has to be expensive. Although installation can get pricey depending on how much work is involved to create the desired look, stamped concrete can be just as appealing when you have a small budget. Here are five budget-friendly ways to enjoy the benefits and appeal of stamped concrete. Capitalize on concrete's ability to be poured in any shape. Not satisfied with the square, utilitarian look? No amount of stamping will fix that. You can use stamped concrete in small areas, but really jazz up the space by changing the layout of the concrete. If you're pouring new concrete, consider incorporating curves. Make your walkway slightly curve. Go from a square patio to a half-circle. 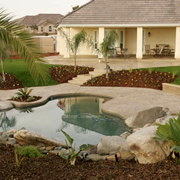 Shape your concrete to flow with the landscaping. It's a budget-friendly tip that won't add to the cost of your stamping ideas, but can add a tremendous amount in aesthetics. See these tips for design ideas for small backyard patios. Add a border. Can't afford to stamp all the square footage of your concrete? Just stamp a border. A patterned border frames the concrete, giving it a finished look. "I don't like the look of a pattern running all the way off the edge," says Matt Zook of J&H Decorative Concrete in Uniontown, Ohio. Borders are an effective, inexpensive way to dress up plain concrete. Keep color simple. One of the biggest factors that can add to your cost is coloring your concrete with multiple colors. Use the same color for your border or your fields and you can save quite a bit. Using color with a pattern will make a dramatic difference compared to plain, gray concrete. You don't have to do a lot to make an impact. Sawcut and texture. 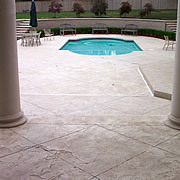 Ask your concrete contractor if it's feasible to saw cut a pattern and then use a texture skin for pattern. Your contractor can create grooves in the concrete (often incorporating the control joints in the design), and then a texture skin can be applied to give a 3-dimensional look. Expand the area you're stamping. 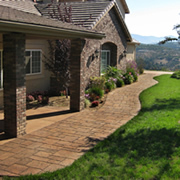 It may seem counterintuitive, but you can add a lot of impact by continuing a stamped pattern from a patio or driveway to walkways and steps. 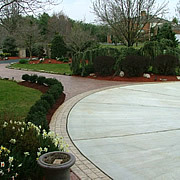 Rather than stamp an entire driveway, consider just doing a border, but then continue that border to nearby walkways, paths, steps, and entryways. Get more for your money by stamping in multiple places and creating a holistic look, rather than just splurging on one, single area.